As the network ages and we have answers that are 7+ years old, we run into situations where changes in technology, etc. result in a once great answer becoming out-of-date, obsolete, or somewhat problematic. We don’t want to lose or delete these answers, due to legacy applications that still need the code but we need to figure out the right way to handle them. What if the user is no longer active on the site? They won’t get the notification to update and then it’s up to someone else to potentially edit the answer. What if the user gets notification and disagrees that the answer is wrong, so they don’t edit it. Now we have a conflict between the original author and another user on the validity of an answer, how do we proceed? This is a great solution to the above problem when the original author doesn’t want to edit their obsolete answer, but we run into the “sorting problem” where the highly-upvoted, accepted answer appears above an up-to-date answer. The hope is that eventually this new answer will gain enough upvotes to move up the list and will be easily visible to people with the same question. Users are advised to make these edits, yet this seems to be a stumbling block. Why, you ask, do I see it as a stumbling block? With the rejection we lose the proposed fix and are back at the start, with an answer that needs a bit of tending to. If a user has full edit privileges, they can make a sizable edit without review to bring it up-to-date but if there are code changes users are told not to touch the code. As you see, we have a disconnect. Users are told to edit and we have posts that need to be edited. But no one wants or is able to edit them, because they might alter code which is a big no-no when the answer is not a community-wiki. What do we do? What can we do to fix this? Before we do anything we want some feedback and a discussion from the community on how we can encourage these edits to these answers (we disagree internally as well). Would you be more likely to edit them into something no longer obsolete, if they were made community wikis? Should we add a post notice that it’s obsolete or out-of-date? Figure out some way to give rep to the user who makes a substantial edit? Something else that we haven’t thought of? My vote is for Obsolete answer. As you have stated, the sorting would stop the new answer from being on top, which means the obsolete info is what the curious guy with the same question will face. This is a big con of adding a new answer, as I've seen lots of better newer answers not getting more votes than the old answer. Votes on answers marked as obsolete wouldn't affect the sorting order. Now, this can either be a mod-flag review case, or a privilege. I don't think treating these votes like "moderator notices" or "flag reviews" is really helpful, as mods in a site as humongous as SO will get tired of reviewing them soon. So, casting a vote as a privilege - a "review-grade" privilege - would do the job. Make the template message sound more human and more serious. Make the votes reversible. i.e. if an answer with this mark is edited, or a VANO (vote-as-not-obsolete) is cast, it "enters the queue". Much like the "reopen queue". I for one, don't think they're that useful. Why? I've seen them so much in the articles I quote a lot, use a lot and cite a lot, that they're not really indicating anything serious to me anymore. This feature would be useless if the messages end up being around in almost every post from back then, or they are seen a lot in posts that don't really need them. This could also work well in sites as big as math.SE, or even physics. But, Newer sites, and the ones with less traffic won't really need it IMO. Those posts could simply bump into the VLQ queue, with new options: "Looks OK" and "mark as obsolete". Also, to encourage people to write answers to these old posts, you can exclude "obsolete" answers from counting towards the question's "answered" status. Which means, if the answers to a question are marked obsolete, and there are no other upvoted answers, the question would appear in the "unanswered" questions' list. ("need answers" is the new-nav version) This would also bring attention to an updated answer once it's written or needs to be, which is what we aim at. The other ways to encourage updating info, that are editing or commenting would hardly get as much traction. The closest would be to see the post active, but that only would happen if the answerer agrees that their answer should be changed, or the answer is community-wiki (this itself makes it less-noticeable), or the edit somehow managed to get approved and not rejected with a seemingly legitimate reason. If we provide this sorting formula, the newer, correct answer can get upvotes, which can make the newest, correct answer leap ahead without having the years of time to attract all the upvotes. At the very least having "Best" could be offered as a tab while we see how effective it is. @Shog points out in the comments that this might not be the right thing to do in the case of answers that are NOT obsolete and encourages plagiarism and pile-on answers. Perhaps the right thing to do is leave "Votes" as the default tab sort for most questions, but use "Best" sorting for questions that meet a certain criteria? I'm just throwing this idea out there for an alternate solution to consider. I love the "Linked Questions" section. Why not expand that a bit? In most cases if I'm looking for another version to a question, the first thing I check is the "Linked Questions" and "Related Questions" sections. Usually I'll find what I'm looking for, but it would be nice if there was a dedicated section for "Alternate Versions of this Question", especially in cases where there is a really long list of linked or related questions. To me, it makes more sense to post new questions with new answers/information if referring to a different version (or even slightly altered requirements or attributes), rather than curate an old question that uses old/obsolete technology with all new answers and information. The important part is to have them linked in a way that is easy for users to find. We already have version-specific tags, and we do allow for questions along the line of "I already saw Question 123, however it is using an older technology/framework and I am looking for an answer using New Technology/Framework", so it seems natural to continue this route. The initial implementation is already there - users just add a comment to the question or accepted answer with a link pointing to the newer/older version of the question, and it shows up in the "Linked Questions" list. If you wanted to get fancier, you could allow entitled users (gold-badge users?) to tag the link as an alternate version of the question to show up in a new section. And it would be scalable in the long run too. It gets hard to curate posts for all possible versions of a question, and you've already pointed out problems related to the voting system or users that are no longer active. This solution would keep each version separate, but linked. Anyway, it was just an idea I thought I'd throw out there to consider, as all options so far are focused on taking action on the original question itself rather than looking at other SE features. Would you be more likely to edit them into something no longer obsolete, if they were made community wikis? Should we add a post notice that its obsolete or out-of-date? No, as someone who uses this site frequently I would find this very misleading and confusing, especially if the information actually was current despite its age. I know enough to look at the date of information posted when evaluating it. And as someone who cares about the site, if this post notice was added by anything other than an automated process based on something like age, I would find the maintenance of such a thing daunting. Figure out some way to give rep to the user who makes a substantial edit? The type of people who can make substantial edits to address other versions are likely those who have been around long enough to not care about rep. Personally, this would be no incentive for me. Something else that we haven't thought of? The only thing I can think of that would make me want to write an updated answer to an older question would be someone asking for an updated answer to help them out. If users could have a button to say "I think this information is outdated and would like to request a more current answer", I would attempt to help them if I could. We already have a system for that (bounties), but think it is too broad and requires too much personal investment to really be viable for promoting newer answers on older questions in a wide scale. As I have said before, please bring out the stats and/or cases. How many of the answers do you consider obsolete? How much is it a problem, actually? You are encouraging fiddling with the basic mechanism of Stack Exchange without the facts, blindly, as it seems. Create a Stack Exchange Data Explorer (SEDE) query or conduct a survey of a random sample of Q&As (if you don't want to scour through the whole SO question base). Post the results of the query. Provide sample answers that you consider obsolete. Explain what makes you think that existing mechanisms will not work to fix the problem. I don't deny there is such a problem. Developers are pushing forward backward and sideward incompatible new versions of popular frameworks and what used to be the state of the art solution just a month ago is no longer correct now. Accumulation of cruft is caused by lack of curation. Wikipedia resolves this by a cadre of editors jealously watching their own articles and a thick layer of bureaucracy resolving conflicts. Stack Exchange was founded on the premise that voting lets the nuggets of truth in the "long tail" percolate to the top and pieces of ... well, other stuff drop to the bottom. For this to work, one needs minimum 30 to 40 (ideally 100 to 200!) technically proficient professionals who can comment on unsound solutions, moderate things, vote, post their own answers, curate outdated but popular answers etc. Why the threshold of 30 to 40? It's when the law of large numbers kicks in - below that you have to rely on a handful of people who aren't always available. For older sites in the Stack Exchange network and even some tags on Stack Overflow, this minimum is no longer available. We are asked to suggest technical solutions to a peopleware problem. This is a great approach, isn't it? What's more, we are asked to consider changing the fundamentals of Stack Exchange. There can't be any unintended consequences, right? Having objective data and clear understanding of how the system works could have prevented us from getting to #4 with a "great approach". We have to talk about the root cause, not about the vague symptoms of malaise. This started out as a comment in response to this one, but got too big. There is a culture that the answers are "owned" by the person who wrote them. That changing the text, no matter how old, should be rejected. There is also a culture in the ranks of the moderators that every bit of information should be preserved. That they are not to do more than squash spammers and decline flags and maintain the status quo. The problem here is that the status quo is an ever accumulating pile of crap with an ever decreasing signal to noise ratio. While the suggestions here are that users are to be given tools to either hide, reorder, or otherwise work around this, it is also clear from voting stats that this is a losing battle (far more upvotes on everything - the conception that the up vote is akin to the 👍 on Facebook or other social media sites). There is a cultural problem and a technological problem and you need to fix both of them. they are not able to be separated. In A Group Is Its Own Worst Enemy Clay Shirky talks about an old lesson on LambdaMOO (note: any SE employees who are unfamiliar with this individual - check your board of directors - there's a reason he's there). There's a great document called "LambdaMOO Takes a New Direction," which is about the wizards of LambdaMOO, Pavel Curtis's Xerox PARC experiment in building a MUD world. And one day the wizards of LambdaMOO announced "We've gotten this system up and running, and all these interesting social effects are happening. Henceforth we wizards will only be involved in technological issues. We're not going to get involved in any of that social stuff." And then, I think about 18 months later -- I don't remember the exact gap of time -- they come back. The wizards come back, extremely cranky. And they say: "What we have learned from you whining users is that we can't do what we said we would do. We cannot separate the technological aspects from the social aspects of running a virtual world. The point I'm making here is that beyond giving us (the community - not the diamond mods) the tools (long overdue) to work on moderating the site you need to step in and take active steps in getting the culture to be one that does not reward or preserve crap (obsolete answers are just part of the symptom). It is not sufficient to just do a cosmetic reordering of the answers. You need to change the culture and attitude of those who say "when you see something wrong, down vote and continue on - trust the community as a whole to sort good material out form bad" because you know that this doesn't work. I'm not saying that the tools of obsolete or reorder won't help - but you need to think bigger and be actively involved with the culture of the moderators, the 10k+ users, the 3k+ users, and the 15+ users. You need to work on changing the perception of a +1 being harmless and equivalent to a +like. And that may mean some bigger changes or getting your hands dirty in the community again. If a question is specifically about change in a technology, it isn't a duplicate. If an answer to a given question has been made obsolete by a new version of a technology or regulation, you can ask and self-answer a new question that's specifically about the new version. The solution described in question "How do I do whatever?" works for Product 5.3, but someMethod() was deprecated in Product 5.6. The link in this notice will put the new question into the "Linked" section of the old question. An example of a question using this m.o. is "Can I change my profile picture using the API version 2?" on Stack Apps. In the answer: Stack Exchange uses the same Creative Commons license as Wikipedia. So feel free to adapt someone else's answer to the old question into your self-answer to the new question, so long as you cite that answer and its author. When showing answers, take into account the age of the answer when deciding which answer to show first. If there is an answer that is only a few months old, and has 25 votes, compared to an answer 6 years old with 100, I suspect the answer with 25 votes that is newer is likely to be a good answer. At the very least, an option for a newly voted question should be available, in addition to the one with the overall highest votes. What this will do is allow users to post a new answer if there is a question that is very obsolete. This new answer that has been highly voted will show up prominently. This will encourage users to provide new answers to these old questions, knowing they still have a chance to get some traction from said question. It's a real problem and often comes down to software versioning based on technology change. And as said, the outdated answer to the current software version is still valid for that particular version. Based on this, the SharePoint Stack Exchange site has always included a version-specific tag - just because configuring Search Service is very different in SharePoint 2007 and SharePoint 2013. When questions are asked, members of the community often ask which version the question belongs to, and when the information is given, the version tag is added. As a user it's perfectly all right to ask the same question targeting another version without the risk of getting marked as a duplicate. It's true as long as the answer is different, since not everything change between versions. We know that this isn't optimal and that we're using tags in a way that we're not supposed to do. But it works and is appreciated. Legacy questions and answers are left untouched, and new version-specific questions are added, without interfering with each other. One could also think of a version-tagging highlighting such as the bug, discussion and support tags on Meta.X.SE. Another suggestion would be to separate the tags from version tags, even if it might complicate things. I've had some recent experience with this. The accepted answer was invalidated several years ago by the spec, but no one had corrected it, though a few other answers mentioned buggy behavior. After spending a few hours trying to figure out why my code was broken, I discovered the spec was changed. An obsolete flag would have been a great option in this case. But I don't think that's enough. It is important to be sure that there is an equally good or better answer that is up to date (maybe even a CW?) on questions with an accepted obsolete answer. Just flagging as "obsolete" but leaving no up-to-date answer in its place is asking for trouble, especially since these answers are often highly-linked to from outside and appear high in search engine results. Another thing that needs to be considered is that these are frequently used as dupe targets. Perhaps there needs to be a warning to dupe-voters that the accepted answer is obsolete. Why an obsolete flag and not one of the other solutions? The community probably won't ever "prefer" that answer - even with scoring changes (and meta-effect ;), I doubt my up-to-date answer would ever surpass the accepted one. The code isn't dangerous, it just doesn't work as expected. Downvotes aren't really warranted, because it's a good answer. Giving rep to a user who makes a substantial edit might be OK, but that puts A LOT more pressure on the reviewers to "Get it right." And then what happens if it gets rolled back and someone with the editing privileged makes a substantial edit? So, for a question like this, a wiki-style obsolete banner confirmed by gold-badge tag users would be the best solution. It's very concise, consisting of a brief synopsis of what's wrong and a link to the spec/docs that demonstrates things have changed. The edit looks like a later edit and not part of the question. These three points pretty much directly apply to the "obsolete" banner as well. no longer acceptable (a notional de-emphasis to morph the check mark ✓ (tick) into something less than that mark in some situations). excesses of possible approaches may lead to difficulties that are unexpected and/or unnecessary. don't make lives unnecessarily difficult for yourselves. bounties demonstrate goodwill and are immediately, universally understandable. Perceptions of obsolescence vary wildly. An author or co-author may, understandably, take offence at their work being branded as obsolete. [Serious Question] Should older (Intel) Mac users post in here (PowerPC Mac forum)? there'll be no lasting/worthwhile agreement on how words such as old, older, classic and retired should be understood. I think first of a 2011 question on Ask Different, Listing all Openmeta Tags and associated Files. It seems that part of the accepted answer is outdated due to a surprising behaviour in a more recent version of a third-party product; complicated by the relatively loose tagging of the question (nothing to indicate that it should not apply to Mac OS X v10.9 (Mavericks)); potentially complicated by some readers who will assume, wrongly, that because Mavericks tagging was based on OpenMeta, the answers will apply to Mavericks; and so on. A person might strictly, logically, mark that accepted answer as obsolete but doing so would surely cause offence. Recently I came across an issue over this which I later discussed on meta. Here according to the user all other answers were outdated just because another user used a FlexBox solution which was not that well supported even when the user answered the FlexBox solution. In such cases, these users will misuse the Obsolete Answer vote. How we can exactly define what's obsolete? Some methods which are deprecated officially are still used by many many people out there. Forcing such answers to change the solutions to the latest might be a wrong thing. I can relate this to mysql_* PHP questions where PHP users use to comment on each question or answer, but it is really not that easy to change the code base if it's huge and for such people, referring to altered answers from mysql_* to mysqli_* or PDO might not be a right way to go for. I would say we can use something like a flag option that a user can flag the post as outdated. In there he can propose a solution to the OP by either explaining him what was wrong, even the code if it was outdated. Here we can let the OP decide whether he wants to consider the suggestion by X user or he can alter the answer all by himself. We can also show a warning on the top of the post saying that your answer was flagged as outdated and we can keep a separate tab in the profile to maintain that queue for outdated post. Coming to what if the user is no more active. In such cases if these flags increase in number on that particular post then we can move them to a review queue where other users will review and drop in their suggestions before the answer getting accepted by the community. Note that such a workflow will only work well if we allow only professionals to suggest and accept the review queue. Also it will be better if we only allow users to flag the posts as outdated having a certain amount of score in that technology tag. So a user having a couple of points in the PHP tag shouldn't be allowed to flag any post as outdated whereas users having, say, more than 500 points should be allowed to flag whereas users with gold badges in that tag should be allowed to review and accept the edited posts if the user is inactive and the obsolete score reaches some threshold. edit the existing post to include a version or date qualifier. This is less likely to be seen as changing the intent and preserves the answer for those working with old versions. Adding a flag as suggested by others would complement this as it would allow downsorting obsolete answers. add a new answer either as an addendum to the other answer with attribution and a link or a completely new answer which includes version information. This gives you the best of both worlds. I find it helpful to start with a concrete (though hypothetical) situation. There is currently no predefined way to copy all the values in a Lua table. This turns out to be a problem that Lua beginners face fairly often. As a result, my question on the topic became Famous and I got a pleasing variety of answers. What should happen if a deepcopy() function were added to core Lua? editing my question to show that the answers were provided before the date the function was introduced. The second option has the additional attraction that the person discovering the outdated question could ask and answer the question for the current release of Lua. As long as the two questions are linked in the sidebar (or the original question closed as a duplicate of the more general question), I don't see many downsides to this approach. Maybe some lost PageRank on posts that have been linked to all over the internet? Let's push a little harder on the first option. When only a few people have voted on outdated answer, it's clearly a better option to write a new answer since that will provide reputation to the person who found the problem and get the correct answer to the top of the stack without much effort. Outdated answers just aren't a problem if the top-voted answer is less than a certain threshold. 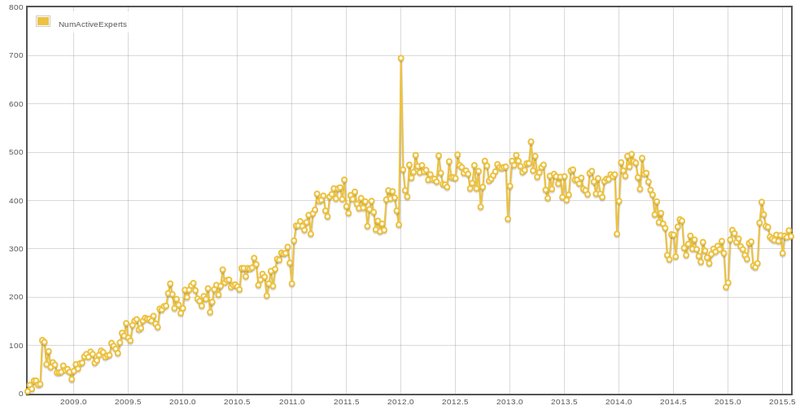 Exactly how many upvotes is too many, I'm not sure, but we are certainly well into the long tail. Even so, there are thousands of questions with lots of upvoted answers that could potentially become out of date. I've tried various ways to detect outdated answers. My most recent attempt looks at answers with anonymous negative feedback a year after the most last edit. For the most part, I don't see answers that are obsolete, but rather controversial. I'd guess that most of the answers that seem incorrect are less out-of-date and more differences of opinion. It's difficult to think of a way to encourage productive edits to obsolete answers without also encouraging unproductive edits to opinionated answers. Ultimately, I think the solution is to think of the problem being obsolete questions rather than obsolete answers. Often technology changes in order to make things that once were difficult and annoying (i.e., good questions on Stack Overflow) easy and sensible (i.e., better explained in the documentation). In these cases an edit to the question noting that the problem is no longer a problem for people using the latest release seems more expedient than trying to change each of the answers or figure out how to manipulate the voting to get the updated answer to the top of the list. Gamify editing by creating a separate edit rep with separate rules ie. +2 per edit upvote, Max +10 per upvote to post etc. I see that the topic of aging or obsolete posts has been on the discussion list for quite a while now. And I understand why it is hard. Perhaps looking at the problem from a slightly different angle might help. A suggestion: Instead of trying to purge the aging answers the site should provide a mechanism to support redirection for a Version Update. Why? Remember that the answer was once accepted and that downvoting, obsoleting, or deleting are all potentially contentious actions. Downvotes for aging posts will not resolve the problem, as has been discussed in detail already. Version Update, however, can be used to provide a strong indication that a more up-to-date answer may be the better answer for someone who is searching for more current versions. A knowledgeable person creates a new question on the subject and nominates it as a Version Update for a particular question. Then he can self-answer the question with his new version of up-to-date answer. (If he is not able to self-answer the question, then the question might provide bait for someone else to answer it.) Since this is likely a version specific issue then proper tagging is essential and perhaps should include a Version Update tag. Members who pass some bar (points, posts on the topic, etc.) can vote up or down on the proposed Version Update to determine whether it should be a redirect. (If more control is needed, then perhaps a Moderator will finalize the redirection entry.) Then the redirection comes to life. At that time: (1) the link to the new answer would appear as a header on the previous answer, and (2) the link to the previous answer would appear as a header on the new answer. This honors the work done in the past, but still provides a public venue for providing updates. I would like to see the simple option to sort by date in both directions. Currently, I can sort by "oldest", but then I have to scroll all the way to the bottom of the posts to be able to see the newest answer - which may not even have any upvotes yet. Sorting by newest would allow people to add posts for updated info without messing up anything related to votes. My experience is that the "accepted" answer isn't always the correct or best answer, anyway. Perhaps the OP accepted the answer before actually trying it out, or perhaps something looked like it should work, so they accepted it, or ... Regardless, as a result, sorting answers by upvotes AND/OR date, especially for those legacy questions where updated answers HAVE been posted, is invaluable. As a note, I've been hit with the "duplicate question" deal, even when the original question and all its related answers were several years old. I attempted to ask about functionality in Visual Studio 2012 (which was stated in my post) and got shut down because the same question was asked and answered in something like 2007. That's just crazy. I did want to attach a version-specific tag to the post, but none existed, and I didn't have enough rep to create one. So, when you consider version-specific tags, also consider how tags will be added for any new versions. For the specific case of an accepted answer becoming obsolete I've two suggestions that basically boil down to "don't treat the accepted answer as special". As I mentioned in the comments and as has been suggested on MSO - Order highest upvoted answer before accepted answer - it would be helpful to just show the accepted answer in its "natural" vote order. Then if it drops off the top spot there's an incentive for the poster to update it. Also if it can be toppled from its spot underneath the question there's an incentive for others to down-vote it should it become completely outdated. Don't prevent regular users deleting an answer just because it's accepted. Again, this only helps if it's completely obsolete. I also think for identifying those posts anybody with an acceptiable score in at least one of the tags, maybe 1k, can raise a flag that this post is "old and needs an update". Then the post goes to a queue where this flag can be reviewed by higher rep people - again of the included tags. So people who are obvious familiar with the content can identify these posts. After it is reviewed we need to get attention to it and try to find someone to edit it: I'm a low-rep user, so I don't know if reputation is interesting for someone with higher rep, but putting out a kind of bounty (maybe not reputation but something other - sorry, I don't have an idea in which higher reputation people are interesting in) to the person who edits it. To verify the edit it must be reviewed again even if you have the edit instantly priviledge. I think this can be a way to motivate people to edit and not only to flag the questions. Add tags that show a versioning and remove the general tags without versioning. For example, remove the general tag sql-server and add maybe a tag, sql-server2005. Therefore the older and obsolete answers will only show up if you look explicitly for them. The upvote effectiveness for ranking should be affected by date and/or version. People should be able to filter questions by date and/or version. I also think version tags should be grouped under the general software tag, i.e. 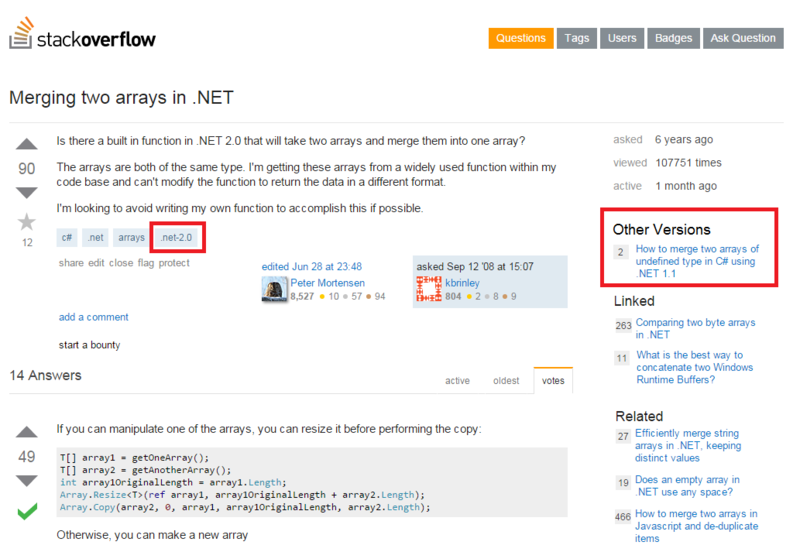 when you select .NET-2.0 the tag should look something like [.NET[2.0]]. This also would mean that the question would appear in a search for both [.NET] and [.NET-2.0]. The answers could provide versions as something like answer tags. I also think that answer versioning is a good idea, with a timeline/arrows to switch between different versions. To do this we should force the user to enter while answering in which iOS, Xcode, language and language version his solution works. Show an "obsolete" notice like "duplicate" and propose an up-to-date similar question. You could use reputation points. Allow for users with over 2000 reputation to choose to have their edit reviewed. Each reviewer can either vote against the edit, or grant 1-3 points. That way minor edits would get 3 points, and noteworthy edits might get 9. Introduce a new reputation perk that enables community voting on changing the accepted answer. Let users with rep over X (15k, or 20k, or 50k, or maybe just with a score of >2k in that tag, whatever) accept answers to questions that have no accepted answer AND are over six months old AND when the user has not answered that question. Let users with rep over X (10k, or 20k, or maybe with a score of >= 500 in that tag) cast votes to change the accepted answer to questions that have had no accept activity (e.g. the asker has not accepted an answer or switched acceptance to a new answer, etc.) in the past six months AND where the voting users are not voting on their own answer (voting on community wiki answers that used to be yours would be OK). At least five/six votes up to around ten votes would be sufficient, I think. No increase in vote weight with increased reputation or tag score, however. If Stack Exchange wanted to get really ambitious, they could even create a new review queue for "accepted answer votes". I chose a six month lower limit because of the emphasis on old technologies in the question here, otherwise it could probably be something like three months. Moderate and Edit Questions, which have obsolete answers, to reflect the version the old answer applies to. Create another question, with the qualified by the version, period, etc, and link it as a closely related question. Stack could implement Parallel Questions/Answers for different versions. These closely related questions/answers would be displayed in a different "TAB" at the top of the page. There is a real problem in questions like: In C++ 98, How do you simulate Constructor Delegation? Rather--Questions could be linked, with tabs: In C++, how do you implement Constructor Delegation? And then have the community define a "Tab" for each individual form of the question, In C++ 98, 11, 14 ... etc. C++ Constructor Delegation, How To? ... Tabs: C++ 98, C++ 11, C++ 14. What is the meaning of this X word? ... Tabs: M-W, Oxford, etc. How to Implement MVC in .NET? ... Tabs: v3.0, v4.0, etc. What classical psychoanalytical approaches are recommended for the treatment of PTSD in Children? ... Tabs: Jung, Freud, (intentional bad example). I can foresee that some people try to post alternative answers in different tabs--but this risk is present in the other solutions as well. There would have to be a "Hard/Fast" rule that tabs can only represent "versions", or Answers in view of a Different referential authority. New answers to old questions hardly ever get upvotes. Most of my answers are to old questions. I write them when I face a problem whose solution wasn't on SO. (I don't just "hang out" on SO, but I try to give back.) Sometimes I write the question as well, but more often one exists. Typically, the existing answers are not "obsolete." More often, there simply wasn't a good answer. Either way, I write my own. I think writing a new answer is better than editing someone else's. I don't rewrite fresh answers, so why should I rewrite old ones? That's disrespectful to their author--putting my words under their name. What if I'm wrong? Writing an answer to a question even a day old hardly ever gives reputation. No one votes on answers to old question. It doesn't faze me, but it feels a bit unfair. My profile says I've "reached" three quarters of a million people, but just 0.6% left a vote. I think key is to get the lurkers coming from Google to vote on answers. First step may be to let unregistered visitors vote. Second step is to make them feel that their vote "counts." A vote counts when the number of existing votes is low, and that can be achieved for popular questions by letting old votes decay. Counting votes in a moving temporal window gets rid of "obsolete" answers as well. Reputation should be rewarded for voting, which can be dangerous, but surely we can profile user actions to detect thoughtless serial voting. We can reward votes on old questions more than on new ones. (And, if all else fails, we can reward new answers for old questions more as well.) Finally, we should allow "thank you" comments since everyone who contributes likes to feel that they're actually helping people. 1) mark as legacy /icon on the question its self. denote this as an outdated system. may need review. [ex windows 95 ini edits vs xp registry edits. xp registry edits may work on win7 where 95 no way... ] once its sure that no current/new systems use that setting mark the question as legacy with a icon so readers know it will NOT work on current things and possibly make a notation win95-98 type blurb available to state what it will or will not work for and possibly a comment stating the reason for the legacy mark. 2)valid but dangerous gets an icon/comment by the answer. ie edit hklm\current user\software if its a 64bit system you may break things if you dont go to hklm current user\syswow64 or what ever the key is for 32bit apps. 3) update for new information/system icon. if say the question is a year or 2 old and some one wants to put a new answer there is now a U icon for the new updates if nothing else hovering left side so if they click on it the page scrolls/ highlights the updated answers. requirements for the U tag are a preface sentance stating why this is added. Bios cant find my hard drive why? Rep and such required to do these is hard to say. and voting to have a question reviewed for legacy which should take a bit of rep should also be available. 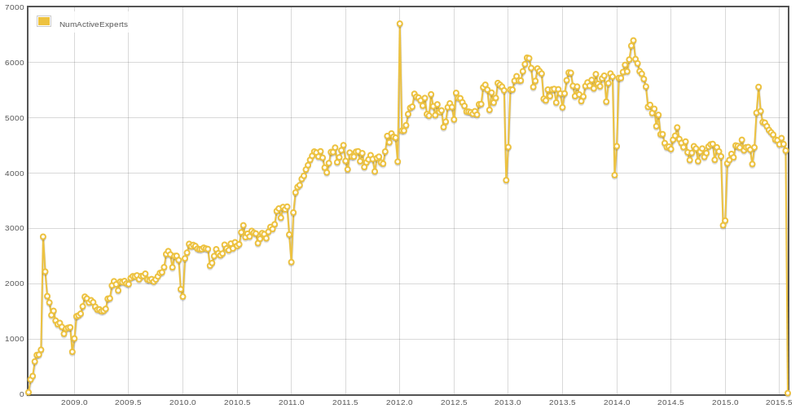 (to start with) Only worry about questions with >= 3 views per day, older than 1 year, and has accepted answer. Let anyone with >= 5000 rep cast an obsolete vote on the question which will mean that all the answers are obsolete now. Be clear that this vote is not for "not enough good answers on this question, or this question could use a better answer". That it's only for questions where the accepted answer is obsolete and there are no other answers that provide the new correct way of solving the issue. Keep the review active in the queue until 2 people provide an answer, gets enough not obsolete votes (3-5? ), or until 30 days (or so) has passed. Make a post history entry on the question with the review link, so easy to search SEDE for questions that were voted as obsolete but didn't get any new answers for that 30 days. So a second chance for people to find and answer even after it exits the queue. Why no edit option? Because reputation is the fuel that drives good content. You don't get reputation for editing (except for measly +2 for suggested edits, but anyone with a bronze badge likely has over 2k anyway). I really don't think encouraging edits is the way to go since I think it will definitely be not as successful as encouraging new up-to-date answers where users can post under their name as their answer and reap the benefits. But why not allow people who know the new correct way to answer in the review? Because this is a privilege queue where you need at least 1 bronze badge to be able to enter. After the review is completed provide a way for people to search through SEDE and regular search to find questions that made it to the obsolete queue and weren't completed as "not obsolete". In conclusion, I really don't think encouraging edits in this manner is the way to go. Since really, reviewers of the suggested edits queue have long been advised to be wary of approving edits that change/add/remove code. I'd rather a new answer be placed than all the content-specific edits going on and the haywire it has the possibility of causing. Also, reputation incentive is needed to keep the ship sailing. Not sure about a similar review badge for this queue, I think if there is a badge for this queue it should be different, but any badge(s) can be sorted out later. Do NOT touch existing valid answers. They're not "legacy", nor "obsolete" - they're perfectly valid answer for technology that author asked about at the time. When I for some reason have to work with same old technology and want answer to same question, I do not want to find dozens of answers about how to do it in shiny new way that are invalid from my point of view because they simply don't work at all in old environment. If you want to provide a new answer without mixing it with old ones, ask a new question specifically targeted in title or text at new version of language/standard/software/whatever and provide answer with new way there. Optionally you can also edit an old question to mention that there are better answers for version later than X.Y.Z in other Q/A. "How do we encourage edits to obsolete/out of date answers?" The problem has likely come about from a combination of The Rules, human nature, the way the site is setup (page layout), rewards (psychological, numerical, perceptual, expediency), etc. - this is evident in many of the answers. Clicking on "Questions" takes one to the main Feed where the (under) Banner goes: "All Questions ... Newest - Featured - etc. ", but there's not an "Oldest" where people could go to be nostalgic, to find questions known to have newer answers, or to hunt for things to suggest for deletion. Self-promotes one as the sharpest knife in the drawer. A 'Legacy Review' Queue - While waiting for new questions or for one's question to be answered people could be encouraged to poke around where they could suggest an improvement and score a point. (Add "Oldest" to the end of the sub-banner Menu where "Newest" appears). Maintenance Points - Approved edits, deletions, improvement, etc. score a point. Trivial Edits - After accumulating enough reputation allow trivial edits (currently the minimum limit is a few characters must be changed). A good example is updating the question "How many Planets in our Solar System" or "How many Moons does Saturn have" - those answers don't require a big edit but they do need a current answer. It's also nice if someone reputable can fix a single annoying spelling mistake in an otherwise good question or answer. Chosen answer first (as someone who's question is accepted is the one who accepts the answer). The Mods can still delete unwanted chosen answers, bumping it back down to unanswered. Highest trending answer third - new correct answers should rise up over legacy unchosen and lessor-popular answers. For some sub-sites a versioning system is appropriate, so we have the newest version's first three followed by the next version's first three, etc. followed by the rest, and the newest (low votes) untrended answers at the bottom. Whatever is ultimately decided upon should be relatively simple, intuitive, cross-site implementable (with a provision for sub-sites to exempt themselves when applicable). We can encourage edits to obsolete answers by providing a means to funnel people towards helping with them, to donate a half-hour during their visit, and score a few points, maybe a "Hundred hour Maintenance" Badge - it's not much but that's all we got. Some sites (EG: workplace.stackexchange.com/) would really benefit (and many comments indicate that people really appreciate it) if the person asking the question would come back and give us an update of exactly which advice they followed (sometimes it's not only the chosen answer) and how effective it was. That helps everyone to know what worked best for their particular situation. The Feedback could also receive up or down votes to score a few more points. It also avoids the situation where a question is asked and answered but it's unclear if the asker came back to thank everyone when no answer is chosen. I'll leave it there in the interests of not adding yet another lengthy answer to be read when there exists so many already and avoid contributing to the problem this question wishes to solve. Somethimes people are looking too for the obsolete solutions since most of third world countries like mine have obsolete systems made with obsolete languages with obsolete compiler versions ( and some times obsolete people too ). I propose to have two and only two accepted answers, the first-working that has solved the problem and the most recent state-of-the-art one. Having this on mind, we could have a plethora of reputation seekeers massively trying to update outdated ( obsolete, potentially dangerous, no longer acceptable, etc ) answers in a wantonly journey to enrich our beloved site. Not the answer you're looking for? Browse other questions tagged discussion edits suggested-edits answers obsolete-information . What is a better way to mark answers as obsolete?